There are a few unspoken truths every dog owner can agree on: Dogs’ paws smell like corn chips, and dog breath smells terrible. As the owner of two Chihuahuas, I have a confession to make — I actually like the uniquely terrible way my dogs smell. After spending time with these two stinky little pups for over a decade, their corn chips-scented feet and their stale breath remind me of home. For most dogs, smelling bad is just a way of life, but that doesn’t mean we, as pet owners, shouldn’t pay attention. In some cases, the stench of your best friend can mean there’s something wrong. A particularly pungent pet odor, especially one that grows stronger or changes over time, could be the sign of an underlying medical issue. Here are some things a bad smell could be signaling according to experts. According to Dr. Katherine van Ekert, veterinarian and cofounder of VetPronto, dogs’ strong odor may be caused by the yeast Malassezia pachydermatis. What about those moments when you lean in for a puppy kiss and are met with dog breath so terrible it blows your hair back? Just like people, dogs need regular baths and teeth cleaning. Birgitta Lauren, dog owner and breeder of Cavalier King Charles spaniels, says she most commonly sees dogs with bad breath caused by a lack of dental care. It’s a slippery slope — infrequent brushing can quickly lead to inflamed gums and infection, with serious dental issues in the long-term. More: How Many Dogs Are Too Many? Dr. Ann Hohenhaus, staff doctor at The Animal Medical Center in New York City, says she most often sees strong “doggie smells” associated with skin and ear infections caused by bacteria, fungus or parasites. “Occasionally, the bad smell owners detect is stinky urine secondary to a bladder infection,” she adds. And that infection your pup has contracted might be an underlying symptom of an even deeper problem: allergies. In some cases, the answer to a strong odor may lie right under your nose: Your dog may need to be groomed more often. Circling back to the infamous “Frito Feet,” this general dog stink is most likely related to diet according to Dr. Laurie Coger of The Wholistic Vet. As a dog owner, never underestimate your ability to “sniff out” a problem. If your stinky dog starts smelling like roses after a bath and a teeth brushing, a regular grooming routine could be the answer you have been looking for. 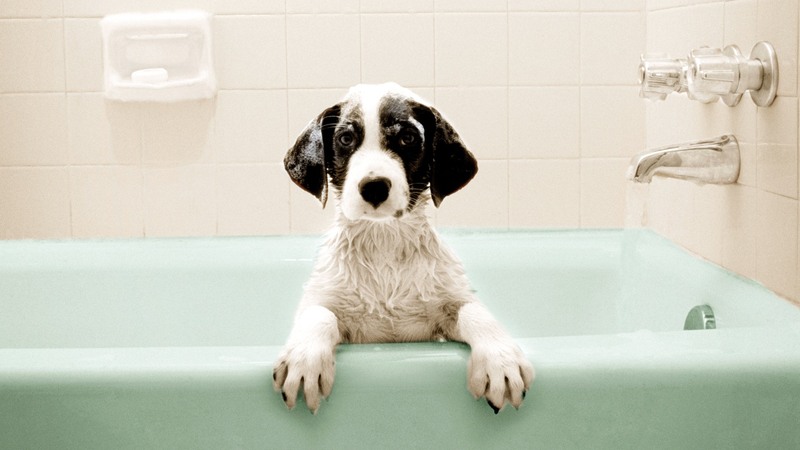 If your dog can still clear a room after a bath, check in with your vet. Your pup’s funky aroma could be caused by a serious health problem.